OTTAWA -- Through pub nights, crowd funding websites, church suppers and craft bazaars, thousands of Canadians are currently trying to raise money to sponsor a Syrian refugee. But it remains an open question just how many privately sponsored Syrian refugees Canada will end up accepting. The ongoing Liberal refugee resettlement program aims to bring 25,000 Syrians to Canada by the end of next month, with original plans for about 10,000 of them to be privately sponsored. But newly released government information shows that by the middle of last December, the government didn't even have that many private applications in hand. Data tabled in the House of Commons in response to a question from the NDP shows that between January 1, 2015, and Dec. 15, 2015, applications were submitted to sponsor 8,214 people. There was a spike of 551 applications last October -- one month after a photograph of a dead Syrian child shone a spotlight on the plight of the 4.6 million people seeking refugee from the violence in Syria. The ensuing national debate on whether Canada was doing enough shone drew many Canadians to the government's private sponsorship program, among them Devon Klaas of Toronto. Through Facebook, Klaas found seven others willing to band together to sponsor a refugee. They've raised the money and now they're working to find a family to support. "It could be months from now, but it could also be next week," she said. According to the data, processing times for privately sponsored applications averaged about 10 months last year. While the Liberals say they remain committed to bringing in 25,000 government assisted refugees by the end of this year, they've not actually set a firm number for how many privately sponsored ones they will accept. "The final number of privately sponsored Syrian refugees that will be resettled to Canada will depend in part on the number of private sponsors that express an interest in sponsoring, and on the 2016 Immigration Levels Plan that is expected to be tabled in the coming weeks," the Citizenship and Immigration department said. NDP immigration critic Jenny Kwan, who asked the government for the data released this week, said part of the issue is how the privately sponsored program is structured. Rather than relying on UN lists or cases identified by private groups, the government should reach out to the Syrians already here, Kwan said. "If the families could make applications here and say, 'This is the family, this is where they are,' and for that to be a match, that would assist the government to reach their numbers." The Liberals did unveil a similar program this week that seeks to pair Syrians in Canada with sponsorship groups seeking people to help. For groups like the one organized by Klaas, the waiting game is hard. "It has been discouraging for us because we've been ready to go for a few months. We want to help," she said. "But we still meet, we're still constantly talking to each other." Ontario Premier Kathleen Wynne suggested this week that private sponsors could take in government-assisted refugees already in Canada, but still waiting for permanent housing, leaving them stuck in hotels. As of Jan. 26, 14,003 Syrians have arrived in Canada since Nov. 4. Of that, 8,004 government assisted, 5,112 privately sponsored and 887 as part of a program that blends the two. 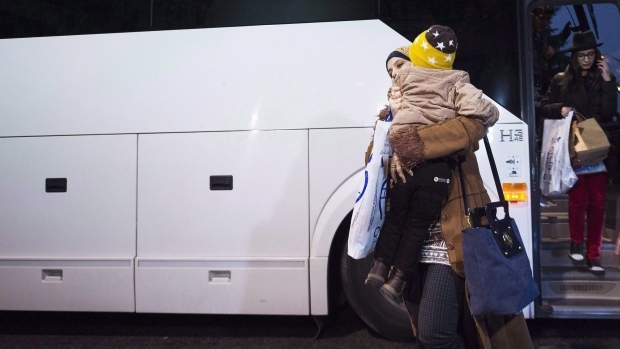 A further 5,886 Syrians have been approved to come to Canada, but have not yet arrived.